Stephen F. Austin State University Students from the Rusche College of Business studied the history of economics, manufacturing and trade in international companies while in Iceland, Ireland and Scotland. While in Iceland, students explored the landscape by visiting the Golden Circle, Gullfoss Waterfall, the Blue Lagoon and more. NACOGDOCHES, Texas - Living out of a suitcase may seem like a dream for wanderers at heart. 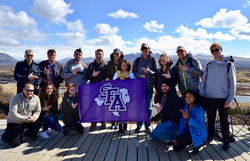 For 24 Stephen F. Austin State University business students this idea became a reality as they traveled for 12 days to three countries, staying in seven hotels and making countless memories. Recently, students in the Rusche College of Business studied abroad in Iceland, Scotland and Ireland to better understand the history of economics, manufacturing and trade in international companies. Before flying overseas, the class studied "Managing Across Cultures: The Seven Keys to Doing Business with a Global Mindset" by Charlene Solomon, who identifies how managers need to be culturally aware when dealing with international teams and projects. Drs. Matthew Lindsey, professor and chair of the Department of Management and Marketing, and Mikhail Kouliavtsev, professor and chair of the Department of Economics and Finance, led this trip and course. Each stop the class made during the trip provided an opportunity to identify key points from the book. Students learned how to separate culture from personal style, and how different cultures view groups, relationships, communication styles, time orientation and change, as well as motivation and work-life balance. "It is one thing to read that different cultures perceive time, personal space or ambition differently, but it becomes very real when you see it in person," Lindsey said. "These trips show our students they can travel and interact with business people around the world and that they are not limited to the boundaries they previously placed on themselves." After multiple flights, students arrived in Iceland and began their trip by meeting with representatives from the Promote Iceland Council, a public-private initiative established to lead the promotion and marketing of Iceland and stimulate economic growth. Lindsey said the council discussed how it uses analytics and social media to promote Iceland tourism and exports. While in Iceland, students also enjoyed the country's natural beauty. At Thingvellir National Park, the group toured the Golden Circle where they saw the famous Gullfoss Waterfall. They also visited the Blue Lagoon, a geothermal spa, and snorkeled between the North American and Eurasian tectonic plates in Silfra, which has some of the world's clearest water and is about 35 degrees Fahrenheit. Business management junior Kelsey Bowers of Lufkin said this was her favorite experience. "It was an incredible experience, and I would highly recommend it to anyone traveling to Iceland who needs an adrenaline rush," Bowers said. In Scotland, the class toured locations in Glasgow and Edinburgh, including Bothwell and Alnwick castles, Holy Island, the Edinburgh Royal Mile and Glengoyne Distillery. At the distillery, representatives demonstrated how to make scotch, and the group learned how the distillery developed a lasting brand since 1833. "The supply chain for the product was discussed from the barrel and barley selection process to determining how much of the product becomes the single barrel namesake and how much is sent to blenders," Lindsey said. "They stressed the importance of being true to the brand." Ireland's itinerary was packed with several tours, castles and sightseeing as students visited Belfast, Shannon, Waterford and Dublin. A private tour of the historic Harland and Wolff Shipyard that produced the Titanic demonstrated how an industry can adapt, Lindsey said. "We learned about the ship-building process and how the 'Titanic' movie provided an opportunity to capitalize on the historic interest in the Titanic and transform the shipyard into an active movie studio," Lindsey said. "The next season of 'Game of Thrones' was being filmed on site. The extent HBO goes to keep the production private was very interesting. They went as far as renting any rooms that provided access to the film location to prevent people from peeking into the set." While at Avoca Woolen Mills, students learned how to make wool linen by hand and with automation, as well as how the company has transformed since 1723 from a local cooperative to a national supplier of woven products and retail stores across Ireland. Similarly, at Waterford Crystal Factory, representatives discussed the brand and provided a factory tour to explain the process of producing world-renowned glass. "The plant we visited produces custom products they are known for, like the People's Choice Awards, the PGA Tour of America trophy and the Waterford Times Square New Year's Eve Ball," Lindsey said. In each country, the group experienced a traditional dinner, sometimes in a castle. SFA graduate student Tyler Fisher from Spring, Texas, said the dinners were one of the trip highlights. "In Iceland, we ate at a traditional Icelandic restaurant where we tried fermented shark and other Icelandic food. In Scotland, we attended a Scottish dinner, complete with a bagpipe player, dancers and traditional Scottish food. In Ireland, we ate in a castle and participated in a play. The entertainment acted as if we were in medieval times, feeding us four courses without utensils and showing us how people dined in those times," Fisher said. "These experiences were the highlight for me because I was able to learn about the culture in each place while being able to try traditional foods from these countries." Upon returning from the trip, students wrote a paper summarizing what they learned. Lindsey said a common theme among responses was that "it enabled them to learn about other cultures and see the business world from an international perspective." "Some now aspire to work internationally, while some realize that might not be for them," Lindsey said. "Visiting businesses allows them to see things we discuss in the classroom in person and in an international setting." For human resource management junior Celine Gragasin from Prosper, Texas, this trip helped broaden her mind. "This trip has helped me grow personally, professionally and academically. I will carry all the skills and abilities I learned during my trip the rest of my life," Gragasin said. "I highly recommend SFA students study abroad. Not only did I learn an abundance of information regarding all the businesses and tourist attractions we visited, but it also encouraged me to travel more." Fisher agreed this trip was a "great learning experience." "Traveling with people I didn't know before this trip was challenging but rewarding. I made many new friends and gained a better global perspective," Fisher said. "I would tell anyone at SFA to study abroad before they graduate. You will learn a lot about yourself, other countries and meet people at SFA you wouldn't otherwise." 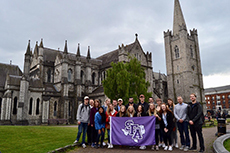 While studying abroad, Stephen F. Austin State University students from the Rusche College of Business toured Saint Patrick's Cathedral in Dublin, Ireland, as well as many international companies.